Magneti Marelli supplies the Alfa Romeo 4C roadster with the technology that helps optimize the performance of its six-speed dual-clutch transmission. Marelli’s electronic control unit and electro-hydraulic actuators ensure that power delivery is maintained during more aggressive shifting when the 4C is in performance mode and that gear changes are more fluid and smooth during cornering, which improves vehicle stability. 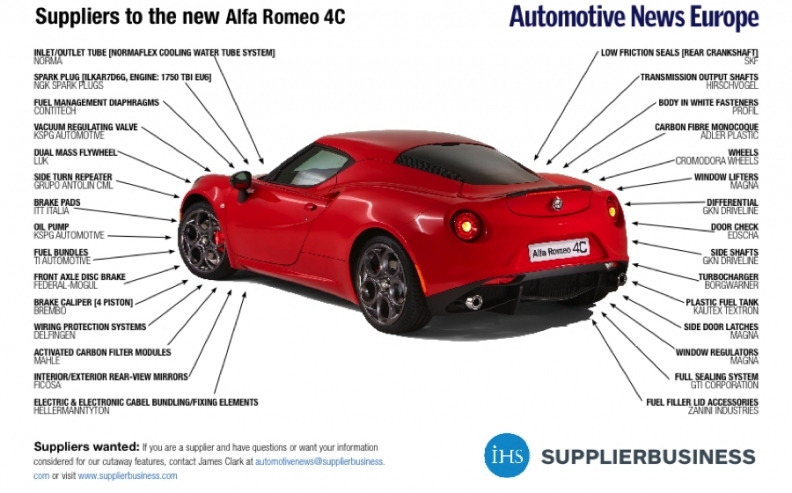 Marelli, which like Alfa is a subsidiary of Fiat Chrysler Automobiles, also supplies the 4C with its LED rear lights, shock absorbers and exhaust pipe. BorgWarner supplies the 4C’s turbocharger, which has a manifold and turbine made from microcast steel so that it can operate at temperatures of more than 1000 degrees Celsius. Alfa made the requirements because it says they help lower fuel consumption during highway driving at medium-high speeds. The 4C’s fuel usage is as low as 5.0 liters per 100 kilometer. At 895kg, the 4C is one of the lightest production cars available. The car has one-piece carbon composite monocoque that makes up the central, load bearing cell of the chassis. It was designed by Alfa Romeo and produced by Adler Plastics and weighs just 65kg. The car’s low overall weight is a reason it can go from 0 to 100kph in 4.5 seconds. With the help of front brake calipers supplied by Brembo and brake pads supplied by ITT Italia, the car can go from 100kph to a full stop 36 meters, which matches the performance of much higher priced supercars. The 4C is produced at Alfa’s sister brand Maserati’s plant in Modena, Italy. Output started in June 2013 and is expected to peak at more than 3,500 4Cs neat year, according to IHS Automotive.